This post might look a little familiar. If you've been following along for the last year, you'll remember that this very same group of ladies came together to bless one family with $1000 cold, hard cash for the holiday season as a way to say "thanks" for all of your support and encouragement over the last year. To keep the spirit of thanks and giving going, we've decided to do it again! Are you ready for the best giveaway EVER? Whether you need a little extra help this holiday season or perhaps you've already completed all of your shopping but wouldn't mind a little bit more money in your pocket spoil your friends and family rotten, then you must enter this giveaway! 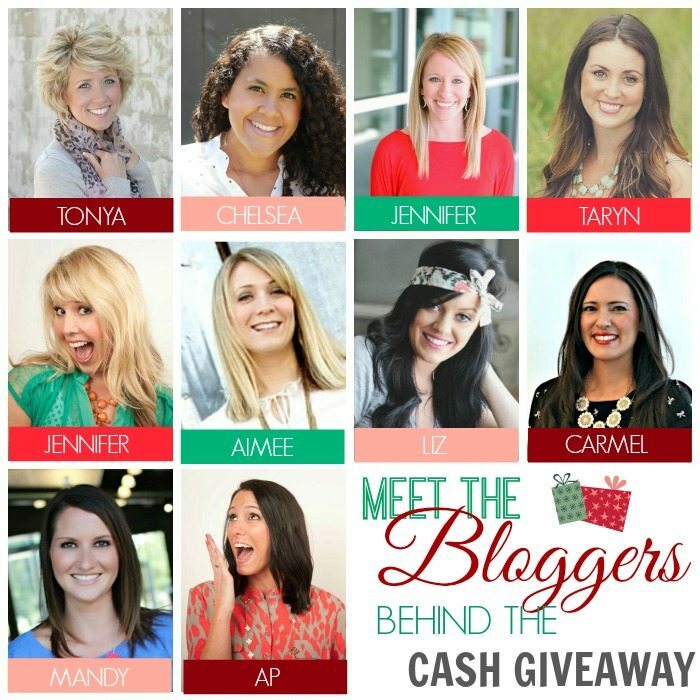 Before you enter, take a minute to get to know the fabulous ladies behind the cash! I've been working with these women for over a year now and they each bring such fantastic attributes to the blog world whether it be through their kind hearts, keen eye for decor and design, honest stories of motherhood or their hilarious sense of humor. Please check them out, you won't be disappointed! As cliche as it sounds, pay off a credit card or make a triple payment on my car loan. I would buy Christmas gifts and pay extra on some bills with the extra cash! let's see, I would pay off some medical bills... and maybe take myself to a spa ;) thanks for the giveaway! I would use most of it to cover my son's surgery expenses. I'd also use some to adopt a couple extra angels this year. I would like to use it to pay off my credit card. I look forward to being out of debt! This really would be awesome to win as this will be the first Christmas on my own with the kids. an extra $1000 means a master bathroom re-do!! I would like to use it for our family vacation to Yellowstone....and maybe get some new boots. Chasing/wrangling three kids in high heel boots is just not....realistic. Save some and use towards home renovations! Save some and use some towards home renovations! New carpet in our living room for sure. The carpet we have now makes me feel as if I need a tetanus booster every time I walk around barefoot. Finish up Christmas shopping! After that I would save whatever was left to use towards my kids birthdays which happen in March and April - Three birthdays in the span of 29 days is never easy on the budget! pay some bills, and buy Christmas gifts. My husband is out of work and we have 3 kids....i'd pay bills and buy Christmas presents! Holy cannoli this is the best giveaway of all time! Thanks AP & co.! I would buy my hubby a Christmas present (we always skip each other), and pay off expenses for baby #2 due 1/9/14. Hooray!! I would love to be able to spoil my kids! We have 6 children so we don't buy a ton for each kid. It would also help get caught up on some bills as a present to myself! Finish up shopping for my kids and parents! This is so great! Well, I would use some towards Christmas. I can't usually afford to get the husband anything after we shop for the kids, so that would be nice. And then I'd use the rest to go towards my hospital bill for a biopsy I had done earlier in the year. I really hated to get THAT bill just a few weeks before Christmas! Put it towards a new shiny camera. I would put the money in my HSA to pay down medical bills. I'd put it toward new appliances! I am always inspired and entertained by all of you ladies! I would buy some Christmas gifts and pay some bills. Thank you for such a generous give away! I am always inspired and entertained by all of you ladies. I would buy Christmas gifts and pay bills. Thank you for such a generous give away! I am happily entering loan repayment on student loans right after Christmas. This may sound weird but I love the opportunity to earn my Master's & now I just want to pay back the debt. $1000 would help pay down an unsub that I have left & since I don't forecast winning the lottery -- this will be awesome!! Christmas shopping or a new couch! I would pay off debt and buy myself a new purse! Would add it to the little college fund! Would add to the college fund. Shop for my son and pay a credit card off! I'd pay off a credit card! If I won this giveaway, I would use it to pay for Christmas for my kids. Unforeseen circumstances have cause a bit of hardship on our finances for this holiday season. I would love to be able to give my kids a good Christmas without having to put it on a credit card that will take forever to pay off! Catch up on some bills and pay it forward to someone else! I'd pay off some debt and fly my mom up for Christmas! If pay off some debt and fly my mom up for Christmas! We normally pick two a family to buy for each christmas, and with this money, we would be able to shop for several underprivileged families & allow them to have a christmas dinner & gifts that they didn't think they would have! We would buy for mulitiple families who currently do not know where the next meal is coming from or if their children will have any gifts to open on Christmas morning. I would save it for after college! 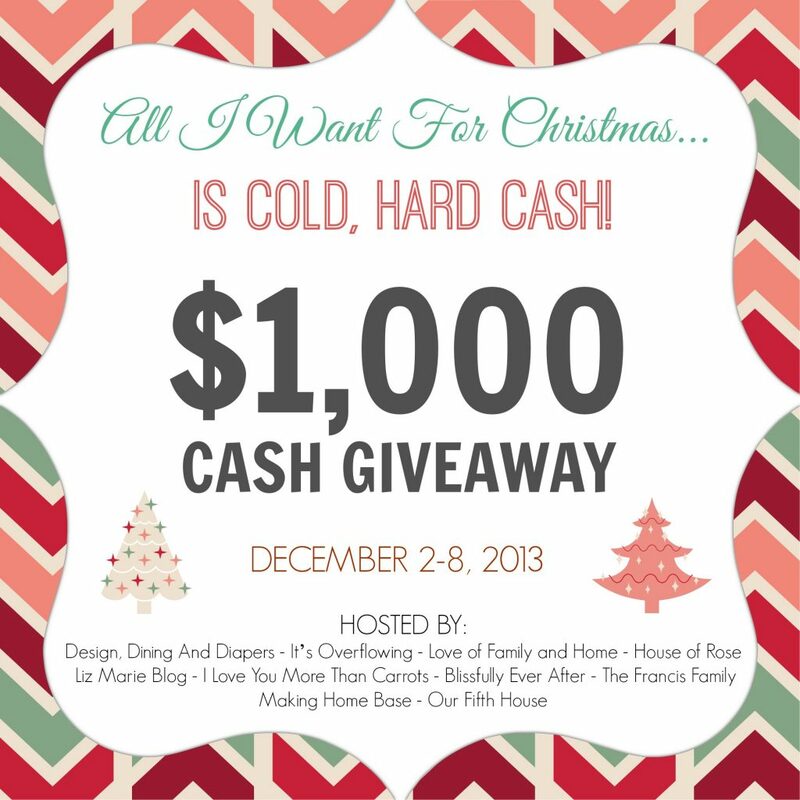 $1000 would finish Christmascushion savings. $1000 would finish Christmas & cushion savings. I would get my daughter's car fixed for her , get the one special gift my youngest wants, and hopefully be able to do a lil something for a few lil friends and a family from the tree at church. Get something nice for the fam, and make sure someone who needs it has a WONDERFUL Christmas too!! Give the fam a nice Christmas and make sure someone who really needs it has a great Christmas too! Start a college fund for my two babies. Start a college account for my babies. I would use it on college expenses. I would help my boyfriend pay off his student loans, because we all know how hard that is! Tile for my kitchen floor! Over 300 sq ft & I have expensive taste. Yikes! I would definitely use it to help cover the rest of the renovations on the house and whatever baby stuff we need. The money will NOT go to waste! I would take a much needed vacation. I would finally pay off our NICU bill from 2012! I would finally pay off the NICU bill from June 2012! I'd love to spend it on me but chances are it would go toward some needed house repairs. The joys of being an adult! I would use it to finish our nursery and buy the rest of the baby stuff we need! I would use it to finish our nursery and buy the rest of the baby stuff we need. Oh my there are SO many things that need attention on top of the obvious Christmas. I was furloughed TWICE this year so savings took a hit, our big girl is moving to her BIG girl room - that needs some updating. And of course making it a magical Christmas and following through with our 25 acts of kindness which could always use extra funding. I would pay off a few bills, take my kids to do something fun, and probably get myself a few things too! Thanks for the giveaway. I would finish my Christmas shopping and pay some bills! Definitely would buy a new front door and light fixtures in our living room. Put it towards our Disney trip in June! Finish up Christmas shopping for the kiddos! I would use it to pay off credit cards and adopt some angels! I would use it to pay off credit cards and to adopt some angels! I'd like a pizza oven. pay for a month of daycare expenses. I am going back to work soon and am not looking forward to that expense again. I would use it to pay for a month of daycare expenses. I would pay off our FINAL credit card and be able to enjoy a much less stressful Christmas season!!! I would buy a new kitchen sink since we are redoing our kitchen. Add to the college fund and do a little work on the house! Buy Christmas gifts... and hire a babysitter and take hubby out on a date! I'd buy lots and lots of Christmas! Get it out in all 1's and throw it around my house. I would use it to pay off the holiday purchases that I'm putting on my credit card. This would be so great. I would use it to finish my Christmas shopping, pay off my credit card bill, and donate to those less fortunate. I am begining to really fall in love with these give aways. Rafflecopter has not been on my side yet, but maybe this time. :) I would definitely use the money to buy my husband's Christmas. This year we have to focus on our son because our cash flow is a little small this year, but I love to give gifts and allowing him to have a few things to open would just melt my heart. Also, I would save a big portion of it for our little girl due to arrive in April of next year (yeah, I can't wait). I would treat my family to something very special this holiday season! I would love to spoil those that are not as fortunate as we are. It breaks my heart to think about the kids that won't get to experience Christmas, as I've always been able to! I would love to spoil a family (or multiple) that are not as fortunate as we are. It breaks my heart to think about kids not getting able to experience Christmas as a joyous time of year! I would put it towards our Disney World fund! I'd put some away in savings for future expenses and I would also use it to buy some Christmas gifts for a family that I know is struggling this holiday season. I'd put some in savings for future expenses then use some to buy Christmas gifts for a family whom I know is struggling this holiday season. Spend it on Xmas or savings OR trip to CO in March! Help us get underway for the arrival of baby #2! We could start on her nursery! I'd buy wonderful gifts for my family...and pay my credit card! I'd buy wonderful Christmas gifts and pay my credit card! $1000! i would buy a new christmas coat, presents for crue and leggings for M3! I'd buy a new DSLR camera! I'd go out for a nice night out, then use the rest to pay some interest on my student loans! I would buy some extra Christmas presents! I would buy some extra Christmas gifts! I would use the money to ensure my husband can take off a little more time for the holidays and spend with me, our son, and our new little one who is due in the next three weeks! i'd start my christmas shopping! I'd use the money to pay off some debt! I'd put it toward credit card debt! I'd donate a third, save a third and use the rest to splurge on an upcoming vacation! I'd use it for Christmas and Birthday gifts. My fiance, parents, and sister all have birthdays within a month of Christmas. Fund my very extensive christmas shopping list! Spoil my loved ones -- including baby #2 due in January! Get started on buying all the stuff we need for Baby #1! Pay bills. Not exciting to many but I would be THRILLED!! Since I am currently pregnant with my first child, I would use it to purchase all of the very expensive things babies need! I would give my baby a first Christmas to remember! I'd like to say I would pay bills, but truthfully, I'd spoil my family! My 1st instinct is to say bills or put it towards my credit card balance but the real me knows I'd probably use it to buy various family & friends some special gifts that may not be easily in my unfortunately limited income Christmas budget. Buy my family Christmas goodies! I'm due to have my first baby (a boy!) at the end of this month, so $1000 would be helpful in so so many ways! Lordy, what wouldn't I do? So many house expenses and there are bajillions of things I want to buy for baby #2, especially if it's a girl! I would use this to splurge on baby #2 who is coming in February! Use it for a vacation! I would finish off my Christmas shopping and use the rest to pay off bills. I would donate a little to an adoption charity that is in need since both my babies came to me from adoption & then the rest I would get new tires on my car & spend some on Christmas presents for the babies!!! Thank you for the giveaway. I would use the money for home renovations. I would buy presents with it! I'd put it towards our family trip to Puerto Rico! My son has a $3000 debt from college he has to pay off before he can go back to school. He had to leave school suddenly a couple years ago to help me because my significant other walked out while I was sick. This would help pay that bill down so he could eventually go get a degree and stop having to deal with the fact that the only thing available is part time jobs(which he has one) that barely keep us above water. Get my crown put on my tooth.. its rotten :( and also pay the deductabible to get daughter her physical therapy needed for cp. Half to bills half to fun!! Oh my goodness, some furniture for our new house, and pay off the washer and dryer! For certain! I would pay bills with some of it and use the rest to give myself and my husband a long deserved vacation! If i had $1,000, I would buy a mattress and furniture for my son's big boy room! Do you need a credit/financial help for your business, mortgage, rent, personal loan, loan for a car or buy a house or even tuition fee for your child? We offer funding at a very low interest rate of 3%. All interested Applicants are to contact us via email; johnoneil945@gmail.com for more information. Apply for a quick and convenient loan to pay off bills and to start a new financing your projects at a cheapest interest rate of 3%. Do contact us today via: jorgebeckerlloans@gmail.com with loan amount needed as our minimum loan offer is 1,000.00 to any choice of loan amount.I am certified ,registered and legit lender.You can contact me today if you are interested in getting this loan, contact me for more information about the loan process, process like the loan terms and conditions and how the loan will be transferred to you. I need your urgent response if you are interested. NOTE:All Responses should be forwarded to:jorgebeckerlloans@gmail.com for quick processing. Looking Back... The Flops & the Favorites! If The Walls Of My House Could Talk. Where I Confess How Much I Hate Meal Planning.